The cataloging of the Texas collection of comedias sueltas at the Harry Ransom Center—funded by the Council on Library and Information Resources, Cataloguing Hidden Special Collections and Archives program—has proven to be a great success in revealing unknown jewels of early printed theater in Spain. One such jewel is Juan de la Cueva’s Comedia de la muerte del rey don Sancho y reto de Zamora, printed in Barcelona by Sebastian Cormellas in 1603. This recently discovered suelta, not included in Mildred Boyer’s Texas Collection of Comedias Suelta: a Descriptive Bibliography (1978), broadens the date range of the collection and provides a unique example of the earliest suelta format. Although a suelta with the same title and imprint had been recorded by Spanish bibliographers, Golden Age theater researchers had considered it a lost edition. 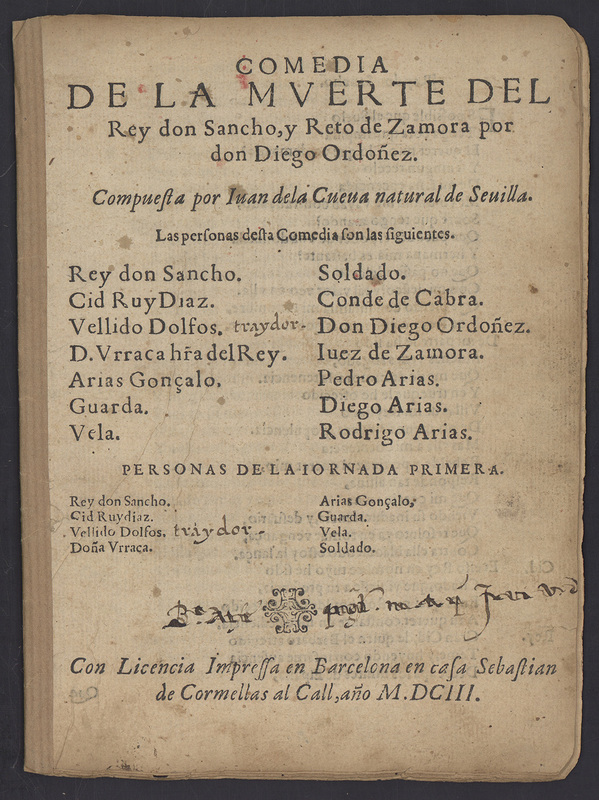 Before this find, the only Juan de la Cueva play confirmed to have been printed as a suelta was the Comedia del saco de Roma y muerte de Borbón. It was also published by Cormellas in 1603, and the only known surviving copy is held at the Hispanic Society of America in New York. The Comedia de la muerte del rey don Sancho was performed for the first time in 1579 at the Corral de Comedias de doña Elvira, sixteenth-century Seville’s most popular theater. It adapted a medieval ballad, introducing for the first time on stage one of Spain’s most beloved national heroes, El Cid. With this Comedia, Juan de la Cueva (1543–1612) pioneered the merging of popular legendary themes with the Spanish classicist theater in an attempt to promote national patriotism. Between 1579 and 1581, Cueva staged 14 plays in Seville that he eventually published as a compilation in 1583. A second edition appeared in 1588. His plays showed signs of some of the key characteristics that Lope de Vega later introduced, and Golden Age scholars consider him a forerunner in the renewal of Spanish theater. Current researchers agree, however, that his major accomplishment lies in the fact that he had the vision to publish his work at a time when it was uncommon for dramatists to do so. With his publishing endeavor, Cueva aspired to reach a wider audience than the one attending the performances and ultimately preserved his work for the present day. The lack of stage directions within the text and the inclusion of a plot abstract for each of the acts reveal an underlying motive of addressing his work to the private reader. By the beginning of the seventeenth century, printed dramatic works had achieved considerable popularity, and printers soon realized the consequent benefits. The suelta format is clearly product of this demand. Sebastian Cormellas’s print shop, located at Carrer del Cal, was one of the most productive in seventeenth-century Barcelona. Cervantes himself visited the shop in the summer of 1610, making it famous when it was later described in the second part of his immortal novel Don Quixote as one of the few nonfictional locations of the book. Cormellas was known to be a savvy businessman who printed on demand, many times without the author’s consent. Whether Cueva was an author ahead of his time or just one of the many writing in Seville in that period, the publication of at least two of his titles in the suelta format and in Barcelona is a reflection of the greater acceptance that Cueva’s theater may have had with its contemporary audience. Little is known about the history of this copy held in the Ransom Center’s sueltas collection. Ownership marks include illegible marginalia and a Latin inscription of the opening verse from the Lamentations of Jeremiah (1:12). This biblical sentence was widely quoted in the late Middle Ages, especially in Gregorian liturgical psalms. No exlibris, stamps, or signatures are provided. The fact that it was not mentioned by Boyer in her bibliography could be a clue to date its acquisition sometime after 1978. Even so, no record has been found relating to the acquisition or the provenance of this suelta. Most likely, it was acquired as part of a bulk purchase of Spanish theater materials and joined the rest of the sueltas collection in the Ransom Center stacks until it was cataloged. Image: Cover of Juan de la Cueva’s Comedia de la muerte del rey don Sancho y reto de Zamora.